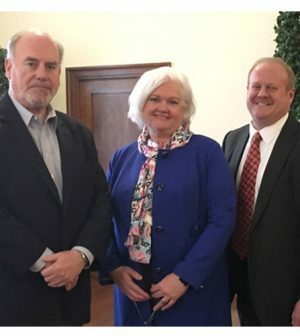 From St. Louis Economic Development Partnership: Chief Executive Officer Sheila Sweeney and other members of the St. Louis Economic Development Partnership leadership team did a presentation at the Belleville Chamber of Commerce’s “Eggs and Issues” event on Monday morning. The focus was regional collaboration and what was learned from the process of putting together a unified bid for Amazon’s second headquarters. In the past fiscal year, the St. Louis region saw more than $1 billion in new investment. Nearly 6,000 jobs were created and more than 20,000 employees were retained through economic development activity. Sweeney also touched on how the Partnership’s business finance division, along with the World Trade Center St. Louis and St. Louis Mosaic Project, serve several counties on the Illinois side of the Mississippi River. “We are very proud of the strong partnership we have maintained with the Metro East communities in relation to these areas,” Sweeney said.